Australia and New Zealand offer a whole new perspective on the world. Surf and sun and a laidback atmosphere combined with friendly people make it a great place to live. It is possible to teach there even if you don't have an Australian or New Zealand passport. There are a couple programmes that you can go through in order to work Down Under. Some of the info below was taken from a book written by Susan Griffith called Teaching English Abroad. You might also want to take a look at Teaching at International Schools and Teaching Exchanges and Fellowships. BUNAC also offers a working holiday visa for those that qualify. Good places for job searches are Seek, Job Search, My Career, and MEC. Check out Australian Immigration which has working holiday visas for those from . . .
TESOL has useful information for TEFL teachers. There are many language schools in Australia, but the ones below have been known to hire non-Australians. You'll have to be a qualified teacher or enrolled in a programme that leads to qualified teacher status in order to participate in most of these programmes, BUNAC is the exception to the rule. Information about verifying overseas qualifications can be found at the Department of Immigration and Citizenship as well as the Teacher Registration Authority. 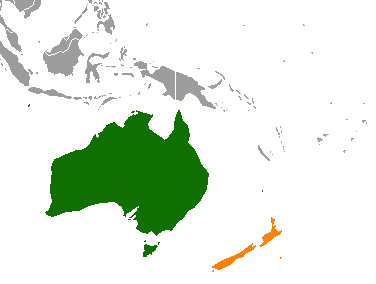 AEUJ has exchanges between Japan and Australia. BUNAC gets work visas for its participants. DECS places teachers in Australia. DET places teachers in western Australia. LECT offers exchanges between Canada and Australia. You can find more LECT links here. Colorado Teaching Exchange has exchanges for Colorado teachers. ITF has teaching programmes for teachers who want to go to Victoria, Australia. Queensland government has useful information. South Australian Education Department offers exchanges with the United States of America, Canada, Japan, the United Kingdom, New Zealand, Germany, France, Switzerland and Denmark. South Australian Teachers' Exchange places teachers in southern Australia. BUNAC offers a working holiday visa for those that qualify. New Zealand Immigration allows those with passports from . . .
English Schools has lists of English schools around New Zealand. English New Zealand has lists of English schools around New Zealand. TESOL ANZ has useful information for TEFL teachers. You'll have to be a qualified teacher or enrolled in a programme that leads to qualified teacher status in order to participate in most of these programmes, BUNAC is the exception to the rule. NZQA is a governmental agency that regulates schools. Expat Forum has some useful info about Americans teaching in NZ. Teach NZ is a governmental website that has information on teaching in NZ. Look at teaching at international schools for more info. You can find more information in Short-term Jobs and Working Holiday Visas. You can find more info in Worldwide Opportunities for Teachers. Poll Results August 2013: Are TEFL certs useful?